Fifteen years ago when the John P. Murtha Fitness Center opened at Highlands Hospital, Dorothy Ridgeway was among the first to sign up to join the gym along with her husband. Ridgeway said that after her heart attack, she walked for exercise and her husband bicycled on the Great Allegheny Passage with a friend three days a week. “When they opened we decided as a couple it was something we could do together and it was good for him, too. He was a diabetic,” Ridgeway said. Her husband passed away three years ago, but Ridgeway continues to attend the gym faithfully. Ridgeway works out at the fitness center three days a week, spending at least 10 minutes on the elliptical, making sure she goes at least a half mile before making her rounds of the various strength-training and cardio equipment. Ridgeway does 20 repetitions on each device, with weights ranging from 30-70 pounds. “I have steps at home, so I don’t need to use the stepper,” Ridgeway said. Tabby Horvath, the wellness center coordinator, said she sometimes has to caution new members not to set their weights based on what they see Ridgeway doing. “She’s been coming here a long time. You can’t compare yourself to other people,” Horvath said. Horvath said she works with each member to develop a routine that is best for them and their goals. Ridgeway, who had a knee replacement, credits her work at the gym for preventing the need for a second surgery. She also does daily stretches. “Before I get out of bed in the morning, I stretch my legs and lift them 20 times and turn my ankles,” Ridgeway said. Exercise is a routine part of Ridgeway’s life and she gets to the gym at least three days a week as long as the roads aren’t bad in the winter. She also takes one day a week off during the summer months. Horvath said the Wellness Center will be holding an open house January 28 to mark its 15th anniversary. Members of the public will have an opportunity to try out the fitness equipment, participate in various health screenings and enjoy light refreshments at the event scheduled for 1-3 p.m., Horvath said. The center offers individual and family memberships, accepting members as young as 14 if they are accompanied by an adult. Free classes included with membership include yoga, aerobics, kickboxing and strength training. “Most of our members are over 50 years of age. We’re welcoming and like a family,” Horvath said. 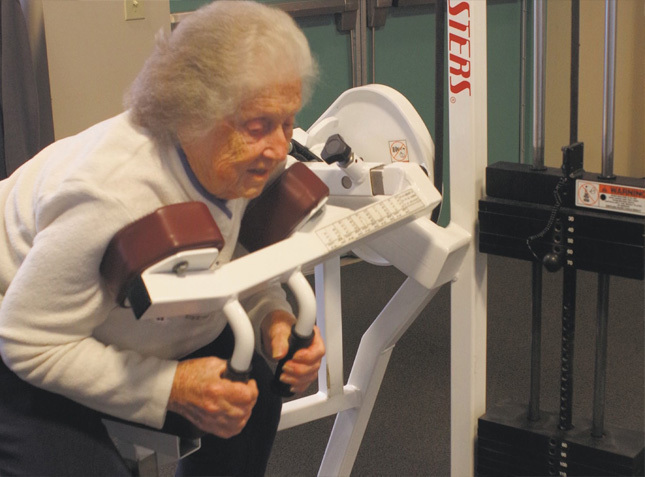 Dorothy Ridgeway, 90, works her abdominal muscles at the John P. Murtha Wellness Center at Highlands Hospital.